Anyone watching the Olympics? I must confess that I have watched about 30 minutes total since the whole thing started last Friday. First, that luge dude crashed and got launched into a pole at 90 mph, finally dying. Talk about a bad and sad start. And the TV networks showing it again and again? WTF? My wife asked me when that happened, obviously not believing it was possible that responsible television would put that up one day after the dude died. It was surreal, the kind of clip you see in a documentary 20 or 30 years down the road. And who watches figure skating? Someone please put a link for the ice hockey and moguls and snowboarding and helicopter snowball fighting events. I want to be marketed to! Am I in a cave? 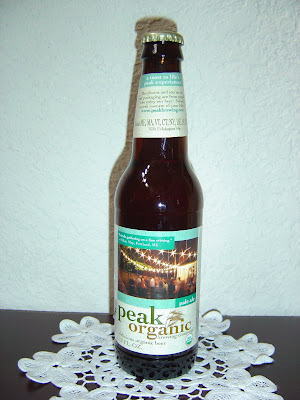 Tonight I am drinking two beers from Peak Organic Brewing Company in Portland, Maine: first, their Pale Ale and second, their Amber Ale. Their bottles have photos and stories from their customers, pretty cool idea. 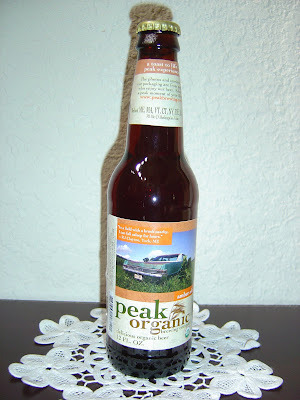 Both labels say "delicious organic beer". You all know how I feel about organic, and if you don't, I don't care (about organic or if you don't know). The main care I have is taste, so you'll be especially happy to hear that both bottles are past their "best enjoyed by" dates of October, 2009. Sorry, whatever! Both are twist-offs as well. The Pale Ale has a citrus and grainy aroma, with a faint caramel scent. Citrus flavors dominate in the beginning with some orange and just a touch of lemon. The hops are noticeable and give a small bite. You will taste grassy and lightly spicy flavors, too. Medium carbonation is right on. This is a crisp and refreshing beer. Lightly bitter the whole way through, good flavors, and you will end with a nice bitter and fruity aftertaste. It's about what I expected. I enjoyed it and would certainly drink it again. The Amber Ale has a caramel aroma. On the sweet side with caramel flavors to start. But you will also taste some smooth creamy buttery flavors, and toasted flavors too. A very faint citrus, herbal, floral something in the background keeps poking in and out. And toward the end, some nutty qualities began to show up. Medium carbonation and body. The finish is dry and not as sweet. Decent. But I liked the Pale Ale much more!